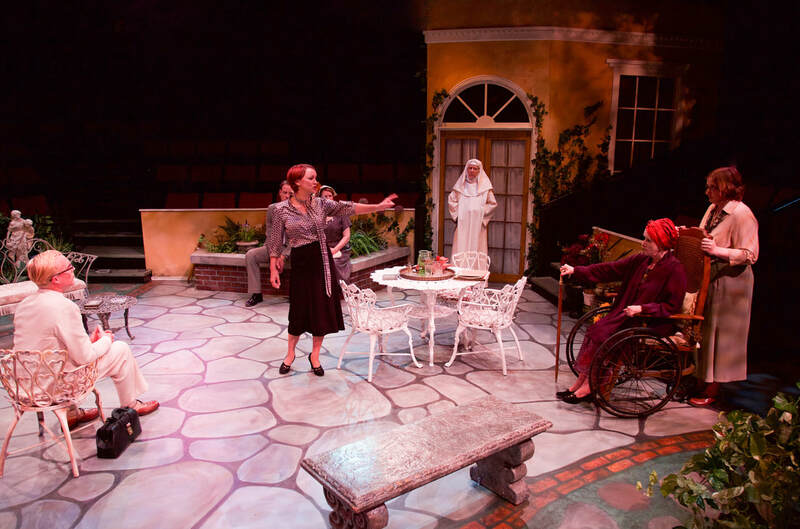 It may be the beginning of the cold, dark, drab winter season here in Minnesota, but on stage at Theatre in the Round, it's still beautiful and lush late summer, with colorful flowers and chirping birds. 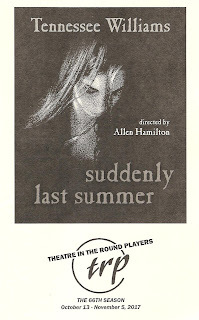 But it's still pretty dark, this being Tennessee Williams' Suddenly Last Summer, a one-act play written in 1958. Like all of Williams' plays, it's beautifully tragic, or tragically beautiful. Flawed people, dysfunctional families, and a sense of despair. Oh, how I love it! 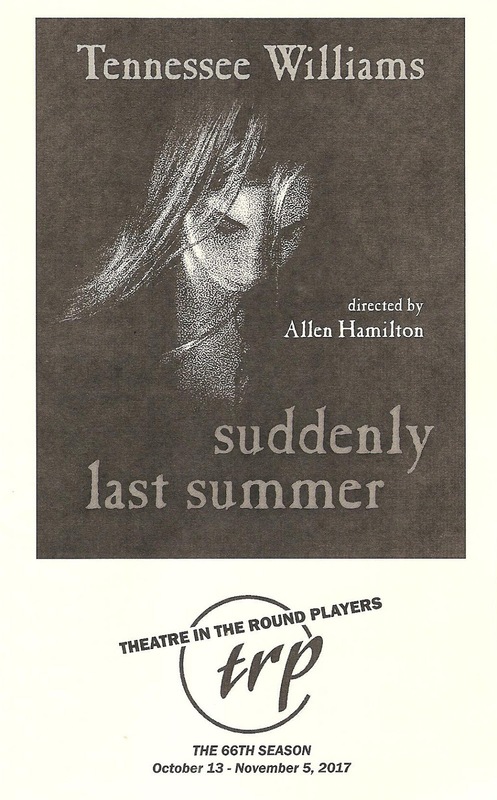 Tennessee Williams is one of my favorite playwrights, but this was my first experience with this play. It was my second experience with Tennessee Williams at TRP (see also Summer and Smoke), and once again they have put on an excellent production of a sad, beautiful, disturbing Tennessee Williams play. Tennessee Williams seems to use similar themes and characters (often autobiographical) in his plays, mixed up in different and interesting ways. The strong and overbearing southern mother in this story is Mrs. Violet Venable, whose beloved son Sebastian died tragically and mysteriously suddenly last summer while vacationing in Europe with his cousin Catherine. Aunt Violet is resentful of Catherine for taking her place on her and Sebastian's summer vacations, and blames her for her son's death. Catherine has been committed to various psychiatric institutions since last summer, and Violet arranges for a meeting of the family (including Catherine's mother and brother) with a doctor who specializes in lobotomies (in case you didn't know, Williams' sister had a lobotomy at his mother's insistence, and it didn't go well - you can read more about that on TRP's website). But first, Catherine must tell the tale of Sebastian's death, and it's not a pretty one. In fact, it's quite horrifying, but well told by the playwright and this production. Allen Hamilton, who also directed the excellent A View from the Bridge at TRP last winter, does a wonderful job directing this terrific cast in this space. It's a tricky thing to make sure that no one in the 360° audience feels short-changed, like they're only seeing the back of the actors' heads. This play is well-staged, with actors subtly moving around to face all areas of the house. 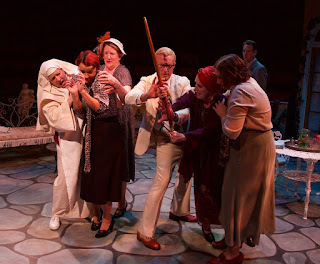 This is a strong seven-person ensemble (including Ryan D. Maddox as the slightly creepy but well-meaning doctor, Muriel J. Bonnertz as Catherine's mother, and Bill Williamson as her brother), but the show really belongs to the two women playing Aunt Violet and her niece Catherine, two familiar Tennessee Williams characters. Annette Kurek as Violet is everything you want (formidable, amusing, terrifying) in the mother character, who loves her children but cannot see them for who they are. Anni Amberg is also wonderful as the fragile Catherine, and is absolutely mesmerizing in the long monologue about Sebastian's death at the end of the play. Suddenly Last Summer continues for one more weekend only (performances Friday through Sunday). If you, like me, love Tennessee Williams' tragic family dramas and lyrical language, do yourself a favor and get to Theatre in the Round (the oldest theater in Minneapolis) this weekend.